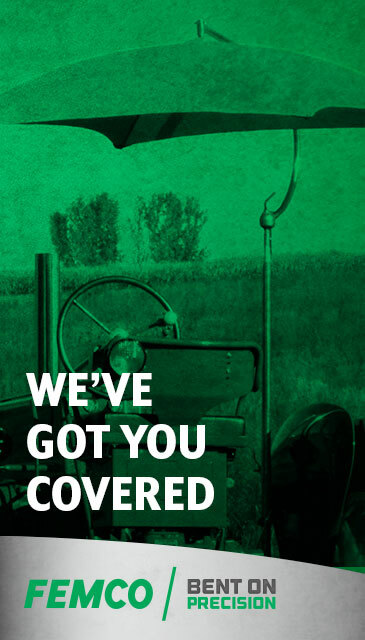 Femco Umbrellas are available for tractors, combines, industrial and other equipment requiring operator sunshade protection. Complete umbrella consisting of a cover, bracket and frame. Metal parts that are zinc-coated for long-lasting, maintenance-free service. Shafts constructed with 1 1/4" heavy duty steel tubing. Rigid framework for cover, built to withstand farm and industrial use. A Universal mounting bracket that adapts to all types of equipment. Umbrella covers are available in canvas or vinyl. We can custom silk screen OEM or dealer names on umbrellas. Call FEMCO for pricing. The documents listed below pertain to the Femco Umbrella product, and include items such as installation instructions. These documents are provided in PDF format by selecting the link below. If you do not have the Adobe Acrobat viewer (necessary to view PDF files), a free Adobe Acrobat Viewer may be downloaded by visiting the Adobe Internet Site.